Being a niche marketplace for global businesses with interest in Africa at heart, Main Market Africa provides the largest concentration of active bulk buyers, sellers, manufacturers, wholesalers, retailers and service providers on a single platform. Essentially, Main Market Africa continues to simplify business activities within its scope by eliminating the traditional hitches experienced by businesses/companies all over the world who seek to present themselves to potential partners in Africa and vice versa. 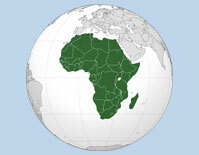 Having strategically positioned itself as the 'melting pot' of interaction among the big and small players, and also, by the integration of effective social communication channels, Main Market Africa is therefore a very effective tool to ensure competitiveness as far as conquering the African business terrain is concerned. Built by a well diversified team of highly skilled professionals in the areas including Trade Facilitation, Logistics, Web development, Business and Social Management, Main Market Africa serves a mix of dynamism, innovation and a culture of support towards the result oriented targets of its unique members.